While I have a ton of 18th century ideas on my plate, and mind, non have really got me inspired to sew lately. That and I have been uber busy with work. Lately my late night internet browsing has been filled with victorian/neo-victorian/steampunk fashion. Not usually my go to eye candy but I came across a few fashion illustrations and I have had this insane burst of costume creativity ever since. 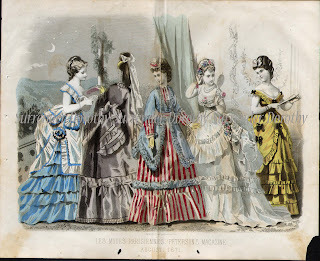 Observe the middle illustration with the red and white striped underskirt and blue polonaise. I have the skirt almost finished....I've had a red and white stripe fabric for a while and was going to do an 18th century English gown for Christmas but I couldn't help myself. The top will be a bit different...over all it will be a bit different but same color palette. Hoping to wear this to Antique Elegance in September and some other steampunk/victorian outings. It has me eyeing some of my other fabrics for other victorian wear...I do love the bustle look. Will try to post pictures of what I've done so far later this week if I get a chance. I love bustles too. :) I started with late bustle before I moved to 18th century. Still intend to do some more, but I'm going to limit myself for now to focus on 18th century. I'm not sure what I'll be wearing for the AE show in September... hoping to be able to go since it's been a while. Looking forward to seeing photos of what you've done so far! 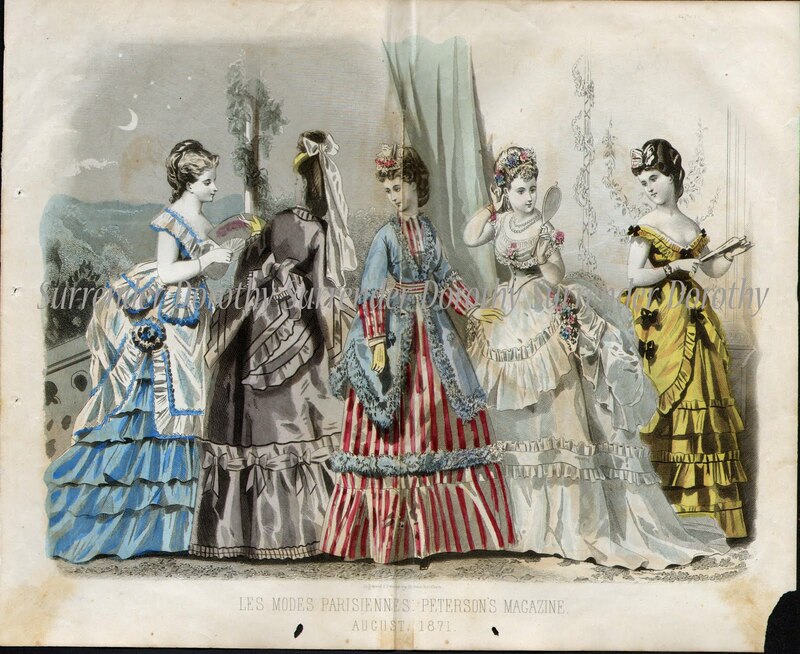 What gorgeous dresses in that fashion plate! That red and white and blue one is quite fetching - no wonder you were inspired by it! I'm most drawn to the yellow and black one on the end. I'm on such a yellow kick right now!